Promote food safety and aid in the prevention of foodborne illness! Post the FDA Safe Food Handling Poster in places where food is processed, prepared, sold or stored. 17″ x 11″ – laminated both sides. The FDA Safe Food Handling Poster is an informational poster which addresses food safety and the prevention of foodborne illness. With easy-to-understand charts and lists, it is an ideal training and reinforcement tool for employees who handle, cook, or serve food. The Federal government estimates that there are roughly 48 million cases of foodborne illness per year. While most healthy people will recover quickly from a foodborne illness, the symptoms are unpleasant. Foodborne illness can also be dangerous to vulnerable populations such as young people, the elderly, pregnant women, and people with weakened immune symptoms. The poster also provides a chart of safe minimum internal temperatures for common foods and contact information for the U.S. Food and Drug Administration (FDA). Instances of suspected foodborne illness should be reported to a doctor and the FDA. Who should post the FDA Safe Food Handling Poster? 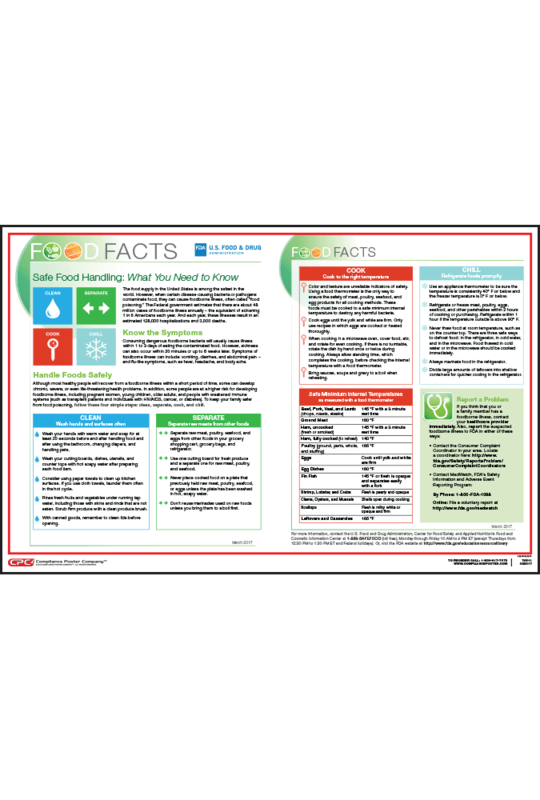 The FDA Safe Food Handling Poster is recommended for restaurants, cafeterias, hotels, institutional kitchens, and other locations where food is handled or served. It can also be a useful resource for home kitchens.